Atlantis is a one woman space race, taking its audience on a journey through Disneyland, dance school, a family holiday and into outer space before asking it to look back and reconsider the planet we inhabit. What did we learn from the race into space? What did we gain in getting there? Can we train for failure? And do dreams really come true? Funny, thoughtful and highly kinetic, Atlantis, which comes to Square Chapel on Thursday, June 1 at 8pm (tickets from 01422 349422) uses popcorn, projection and a paddling pool to explore the answers to all these questions. Along the way, the show considers the idea that we all inhabit a spaceship – spaceship Earth - and draws parallels between our planet and the shuttle’s namesake, the mythical island that sank beneath the waves. The show is performed by Lydia Cottrell a dancer, performer, artist, cosmonaut, prepper and apocaloptimist. Her work is largely autobiographical, drawing on personal experiences and finding ways in which these experiences relate to that of others. She left school at 14 to follow her dreams of becoming a dancer and had some successes but a lot of failure along the way. Most recently she was the winner of the Hull Dance Prize in November 2016 and is currentlyworking on new commissions with the Northern School of Contemporary Dance and the West Yorkshire Playhouse. “The idea for Atlantis came about whilst I was on a family holiday in Florida,” said Lydia. “Whilst I was there I ended up spending three days alone in Disneyland, doing a lot of people watching, I also visited the Kennedy Space Center and felt completely humbled when I stood under the Atlantis Space Shuttle. “All of this made me think and reflect on my life journey, the journey of the human race and what it takes to actually achieve something. Mainly the show is about dreams, how hard we work to achieve them, how failure along the way affects us, and what happens when we do reach our goals,” she added. 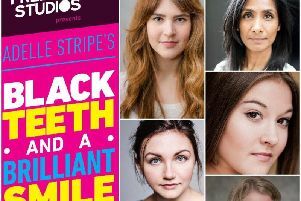 We’ve teamed up with the production and with Square Chapel to offer five pairs of tickets to see the show in our free and easy to enter competition. All you need to do to be in with a chance of winning is answer this simple question. Q. What is the name of the mythical island that sank under the sea ? Closing date is noon May 26. Usual rules apply. Winners will be informed immediately.